"Paradoxically, the heat-trapping greenhouse gases believed to contribute to global warming are actually helping rebuild the ozone layer. Paul A. Newman, who co-chairs the U.N. panel, told the AP higher levels of carbon dioxide and other gases help cool the upper stratosphere, which increases the amount of ozone." Note also that the computer-model output above demonstrates that CO2 is a very strong cooling agent in the stratosphere and CO2 is neither a cooling or warming agent of the troposphere [indicated by the light blue at the CO2 primary wavenumber at ~700 cm-1, or ~15um]. 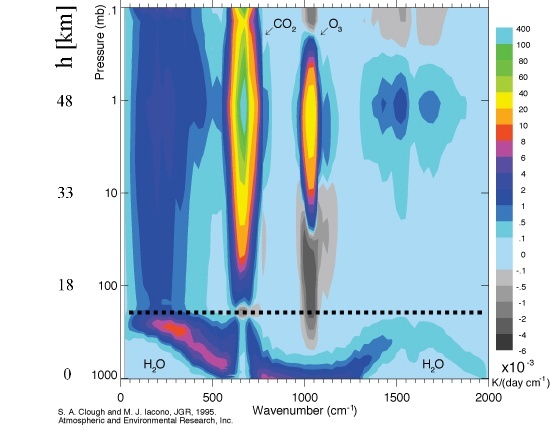 The modeled output shows CO2 to have a tiny blip of slight warming effect [light gray] at the tropopause [shown by dotted horizontal line], but clearly the net effect of CO2 shown in this diagram from the surface to the stratosphere is cooling, not warming. And there's also this: New paper finds global warming caused by CFCs, not CO2; predicts cooling for next 50-70 years and Why does CO2 cool the stratosphere & warm the troposphere? Warmists don't agree on an answer, which also suggests CFCs have a cooling effect on the stratosphere as well. Gail Sullivan covers business for the Morning Mix blog. That dashed line across the middle is the idealized Tropopause. (In reality it varies from about 17 km over the equator down to near ground level at the poles (or “indistinct” as they said in the wiki…)). Below the Tropopause convection rules. Above it, radiative heat transport rules. Right off the bat, we have a big clue about why AGW (human caused ‘Global Warming’) is based on errors. The belief that radiative forcing at ground level ‘matters’ is simply shown a fantasy by the existence of the Troposphere. BY DEFINITION, it is convection, evaporation, condensation, clouds and rain that matter in the Troposphere. But lets look at that graph some more and pick up some interesting bits. A line-by-line model (LBLRTM) has been applied to the calculation of clear-sky longwave fluxes and cooling rates for atmospheres including CO2, O3, CH4, N2O, CCl4, CFC-11, CFC-12, and CFC-22 in addition to water vapor. The present paper continues the approach developed in an earlier article in which the radiative properties of atmospheres with water vapor alone were reported. Tropospheric water vapor continues to be of principal importance for the longwave region due to the spectral extent of its absorbing properties, while the absorption bands of other trace species have influence over limited spectral domains. The principal effects of adding carbon dioxide are to reduce the role of the water vapor in the lower troposphere and to provide 72% of the 13.0 K d−1 cooling rate at the stratopause. In general, the introduction of uniformly mixed trace species into atmospheres with significant amounts of water vapor has the effect of reducing the cooling associated with water vapor, providing an apparent net atmospheric heating. The radiative consequences of doubling carbon dioxide from the present level are consistent with these results. For the midlatitude summer atmosphere the heating associated with ozone that occurs from 500 to 20 mbar reaches a maximum of 0.25 K d−1 at 50 mbar and partially offsets the cooling of 1.0 K d−1 contributed by H2O and CO2 at this level. In the stratosphere the 704 cm−1 band of ozone, not included in many radiation models, contributes 25% of the ozone cooling rate. Radiative effects associated with anticipated 10-year constituent profile changes, 1990–2000, are presented from both a spectral and spectrally integrated perspective. The effect of the trace gases has been studied for three atmospheres: tropical, midlatitude summer, and midlatitude winter. Using these results and making a reasonable approximation for the polar regions, we obtain a value for the longwave flux at the top of the atmosphere of 265.5 W m−2, in close agreement with the clear-sky Earth Radiation Budget Experiment (ERBE) observations. This agreement provides strong support for the present approach as a reference method for the study of radiative effects resulting from changes in the distributions of trace species on global radiative forcing. Many of the results from the spectral calculations reported here are archived at the Carbon Dioxide Information and Analysis Center for use by the community. I’ve added the bold bit. Now notice that there is a nice bright diamond of CO2 radiating away heat in the stratosphere, but just below it and below the dashed line, in the troposphere, the CO2 band is doing nothing. That’s what they are talking about. The CO2 band is already closed in the troposphere. It is NOT going to be any more closed with more CO2. Furthermore, “downwelling” IR from the CO2 above it will NOT open it. (Nor reach the ground). A shut door is shut. All the noise and smoke about CO2 and downwelling IR is just stuff and nonsense. That door is shut. CO2 as a radiative agent is limited to action in the stratosphere, where it is a net cooling agent. Add more CO2, it will not make the ground warmer. Now enter Le Chatelier. At most, CO2 could cause some other species to have a reduced effect. It could cause some change in the percent of IR radiated in the stratosphere via O3 or via the small water vapor present. It might couple to the water in the troposphere and conductively put some energy in the tropospheric water vapor engine (that then conducts it to the stratosphere). Le Chatelier says to expect an adaptation toward restoration of equilibrium, and there is a lot of water available to act in just that way. So that’s the first and most likely place to look.
" in the troposphere, the CO2 band is doing nothing. That’s what they are talking about. The CO2 band is already closed in the troposphere." Why are we forgetting that the Stratospheric altitude temp. coefficient is positive and more CO2 at higher temperature will radiate more efficiently than with less CO2? CO2 forcing is negative, ie increased radiation with the temperature gradient. So yes the overall Trop can have its temperature lowered since there will be double CO2 radiating in all CO2 bands. You do not convey a logical response in any of this lengthy (unpublished) blibber blabble. He/she is clearly uneducated. If you can explain the axes on your very first figure i will believe everything you preach! In the few figures they attempted to present, the correlation between axes made little sense.